^ Leventhal, Josh. Portland Beavers Plan Move To Tucson. Baseball America. October 14, 2010 [March 25, 2011]. ^ Larabee, Mark. Major League Soccer plan still alive as Portland council endorses latest plan. The Oregonian. June 24, 2009 [June 25, 2009]. ^ Straus, Brian. 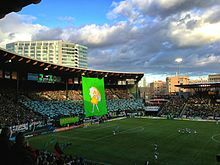 Portland Timbers to change name of stadium to Providence Park. SI.com | Planet Fútbol. Sports Illustrated. [February 11, 2014]. ^ Floum, Jessica. Portland Timbers to move forward on Providence Park expansion. The Oregonian. December 20, 2017 [December 20, 2017].